On the way home from a greenways conference in North Carolina, we stop in Savannah, Georgia, which turned out to be a wonderfully historic and attractive city. I need to return there soon for a weekend of bed & breakfast tourism. At long last, 12 YEARS after I wrote the above, Maureen and I return to Savannah for a relaxing, enjoyable weekend. And this time, I can investigate much of the city historic district, and at a leisurely pace. 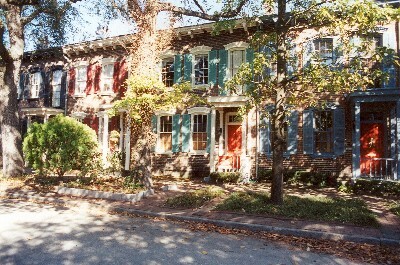 The historic downtown district, at one mile by one mile in size, is exceptionally walkable. Particularly because most of the downtown blocks are quite small in size and the gridded streets are all connected. The 20 remaining public squares interspersed throughout the downtown are all fronted by historic buildings that look over them. The squares provide a picturesque, green respite that blends in to the walkable character of the downtown with their formal design. Many of the streets are paved with cobblestones, which were formerly ballast for ships that sailed to Savannah in Colonial times. For lunch on Saturday, we sample a delicious Moon River Microbrewery offering of pasta and home-made beers (I recommend the sampler of their several beers). We enjoy a lovely evening horse-drawn carriage ride on Saturday night. We see ENORMOUS ships pass outside our hotel room at River Street Inn along the Savannah River. Ships so monstrous that they would dwarf The Titanic. Ships that would make The Queen Mary appear to be a tiny rowboat. I am saddened to see that despite the outstanding, timeless urbanism, blemishes have appeared in one of America’s best-designed downtowns. First, there are quite a number of surface parking lots and parking garages – which have a deadening effect on even the best downtowns. In addition, many of the streets have too many lanes, making pedestrian street crossing sometimes difficult. There are too many streets that have been converted to one-way operation, which accelerates average car speeds. Tragically, a large number of "modernist" buildings have been constructed in the historic downtown, and they stick out like desecrating sore thumbs – veritable middle fingers upthrust to flip off the historic pride that they scoff at. They are memorable only in the sense that they are so jarringly out of place, inwardly turning, and embarrassing. Finally, restoration, renovation, and healthy infill development in the historic district are, according to a wine shop merchant we hear from, being obstructed by a strong opposition to gentrification. This effort to "retain affordable housing and diversity" in the district will, I fear, trap the city in a downward spiral as the historic buildings slide into increasing disrepair. 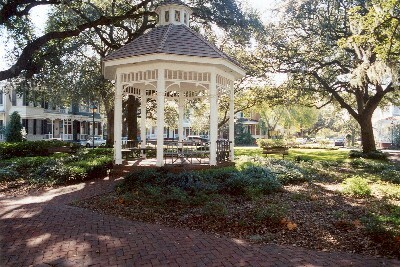 Fortunately, at least for the time being, the "good bones" of the downtown (the small blocks, the connected streets, the squares, the historic buildings fronting the public sidewalks) will keep downtown Savannah a shining beacon of walkable urbanism even despite the suburbanizing, modernist influences that incrementally threaten it. On Sunday morning, before our departure, we go for an unhurried morning jog through the district. I am astounded to see the many colorful, vibrant rowhouses and townhouses that line many of the streets in the southeast portion of the historic district. We then enjoy a delightful brunch at the Firefly Café, a popular local institution nestled next to a wonderful public square on Habersham. 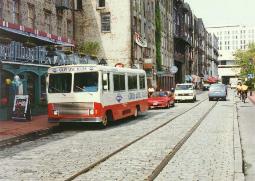 In 1990, the population of the city was 137,560. The city is at the mouth of the Savannah River. It is the oldest and second largest city in the state, and Georgia's principal seaport. The city was founded in 1733, when General James Oglethorpe brought 120 settlers to the foot of Yamacraw Bluff. The community was laid out using a formal, traditional plan and therefore remains one of the most charming cities in the U.S. The city was captured by the British in 1778. But Revolutionary forces led by Mad Anthony Wayne recaptured the city in 1782. Union troops captured the city in 1862 during the Civil War. The Cotton Exchange in the city was one of the world's largest when King Cotton rose after the War. Today, the city boasts over 1,000 historically significant buildings, and the nation's largest landscaped urban historical district. The city is sometimes called "The first city of the South."